Printbox tools allow you to upload files to your Printbox user account. 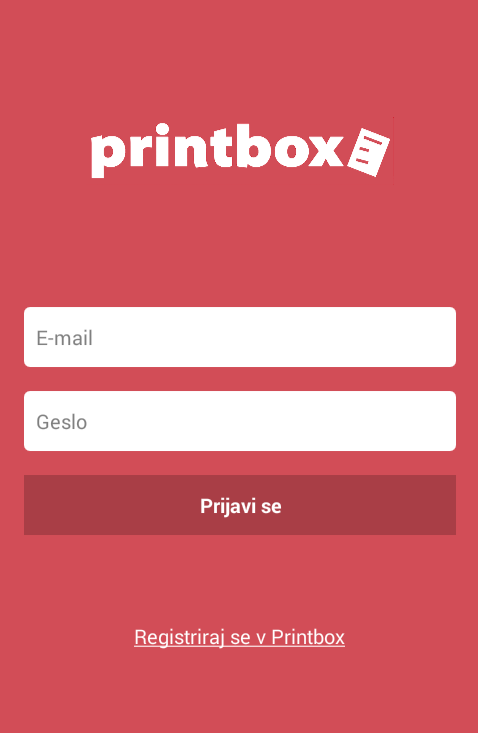 In addition, the Printbox mobile app allows you to manage your Printbox user account. Printbox Windows program allows you to upload files from your personal computer directly to the print queue of your Printbox user account simply and quickly. The Printbox system automatically converts files to PDF. Is your computer suitable for to use the Printbox Windows program? The program is suitable for all the latest Windows PC operating systems: WIN XP, Vista, 7, 8 and 10. If you have a suitable Windows operating system on your computer, check out the operation of the Printbox Windows application. How to install the Printbox Windows program? Click on “Download Printbox Windows program” and open the downloaded installation file. Follow the instructions and restart your computer after the installation is complete. The Printbox Windows program works like a virtual printer. After installation, a new printer – “Printbox” – will appear among your printers. The Printbox Windows program will convert your file to PDF (with the exception of JPG and PDF files) and will upload it directly to the print queue of your Printbox user account. How to upload files to the print queue of your Printbox user account? It’s very simple! Open the file that you want to print (by using any program) and select the function “print”. Then select the Printbox printer from the listed printers and click “print”. That is all you need to do: your file is already being uploaded to your Printbox user account. 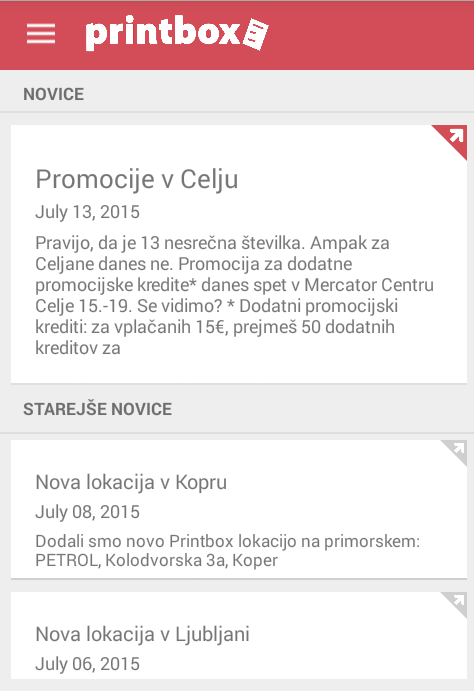 You can print it in any Printbox kiosk in Slovenia. All the latest Windows PC operating systems, WIN XP, Vista, 7, 8 and 10. When you use it for the first time, the program will request your user data: the e-mail and password of your Printbox user account. If you are the only user of your computer, it is recommended that you select the “remember” option, so that you do not need to enter your user data on this computer in the future. If the computer is used by other people, make sure you always log out after you finish using the account. The programme can be run from the taskbar – you can find it in the bottom right corner of your desktop. Browse your Printbox user account. Follow the status of your credits. Check the price list of your Printbox services. Upload documents to the print queue. By using the additional options, send files to the Printbox print queue from any location in your phone (send to Printbox). Browse the map of Printbox locations. 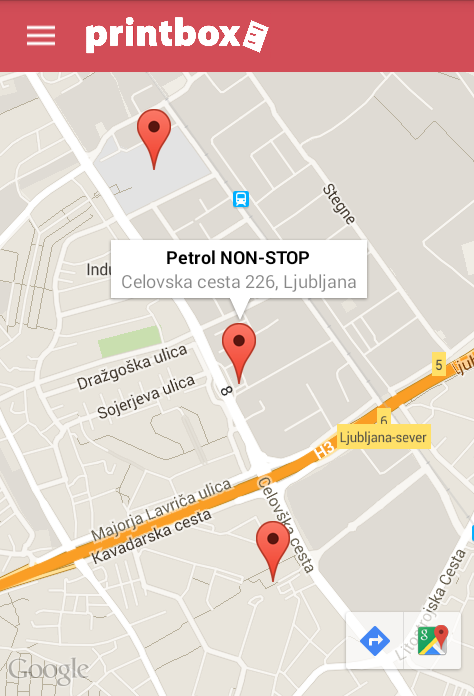 Start navigation to the selected location through an appropriate application on your phone. Delete redundant files from the print queue and history (individually or multiple files at once). Follow news and promotional campaigns. When you use it for the first time, the app will request your user data: the e-mail and password of your Printbox user account. Once you have completed login, you can enter the application. In the upper left corner of the main menu of the application, you can see the status of your credits. In the menus you will find most of the functionalities that you are familiar with from the Printbox kiosks. From the print queue of the mobile app, by tapping on the icon for adding files in the upper right corner. 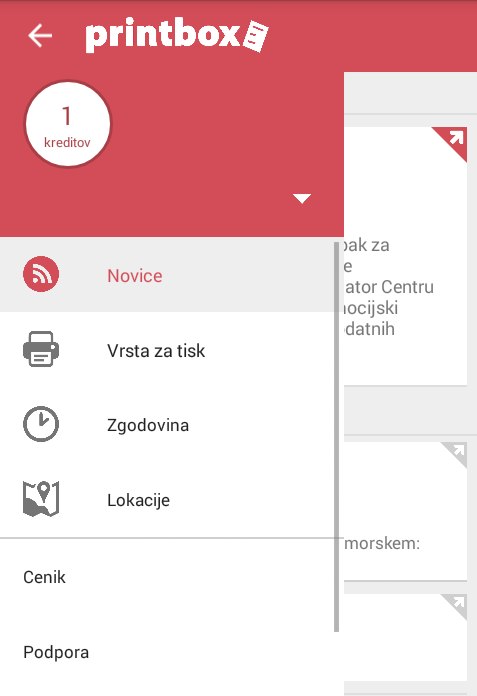 From any location in the phone where the files, suitable for printing, are stored, open the selected file, tap “share” and select the option “Printbox”. You can also delete files by tapping on the file that you want to delete and then tapping on the icon “recycle bin”. If you want to delete several files at once, touch and hold on one of the files. Additional options will appear and you can select multiple files at once. The app will help you find the nearest Printbox by tapping on “locations”. In the bottom right corner of the map you can see icons to start navigation or guiding to the selected location. 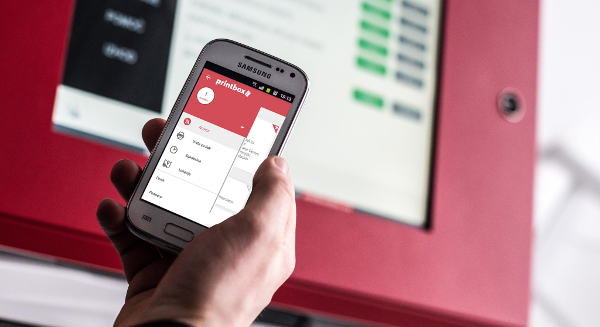 The Printbox Android mobile app is compatible with all mobile devices (phones, tablets) with an operating system Android 4.1 or higher.